That video is so depressing that it is hard to watch after the picture of the beaver is shown next to the "cryptid." How did this guy get on TV? I guess "We say a mysterious creature in the lake" is better than "I am an idiot/con artist who likes to videotape beavers." More beavers? Hmmm.. I am getting ideas for bad off-color jokes. I should quit while I am ahead. "I've asked myself thousands of times, is there a possibility that I could be mistaken, and I just can't see where I could be." Well, I wonder how much credibility you gain among the credulous when you make this statement? It seems to be the closest thing to peer review for a crypto-zoologist. The thing I am annoyed by is the constant insistence that it had no hair. Anyone who would make that statement with such certainty has obviously never seen an otter, a beaver, or a harbor seal in the water and then out of the water. All of those creatures have a thick coat of fur, yet in the water they are as smooth as a fish. It seems to be a common problem everywhere. Here in the Champlain Valley we have our own famous lake monster, Champ. People have been seeing Champ since before Champlain came, but of course nobody has gotten a good picture, though oceanographers have covered much of the lake by side scan sonar. If you do a search for "Mansi Photo" you'll find the best ever picture of Champ. What you may not realize when looking at it is that what is usually shown is an enhanced drastic crop of a picture taken with an Instamatic camera by someone who was not sure enough at the time of what she saw to take more than one picture. There's an interesting analysis HERE. When I first saw the picture, after having sailed for some time on the lake, I immediately assumed it was a cormorant. At a certain scale on a bright day, the small choppy waves of the lake act as "dazzle camouflage" and change the apparent boundaries of common objects, and swimming cormorants look much like this at times. They appear, disappear, and shape shift as you watch. The experts are more inclined to think it's a log. Either way, we eagerly and hopefully await a proper picture of Champ. What fun it would be to be proven wrong. and, try your damndest to branch out from that!!! I'd rather type "I'm a con artist who likes to videotape beavers" in. There are a few issues with eye-witness accounts. First and foremost, our memories play tricks on us. That's obvious. Less obvious, though, is the second issue: Most people don't actually have a very good foundation in biology. I've known people who've thought cows were deer, or that goats were male sheep, for example. They can't identify common domesticated organisms. How well do you think they'd identify something no one had ever seen before? And if you're not familiar with things like, say, bear behavior, how can you be sure that it's NOT a bear you're seeing? I couldn't tell you how a bear walks when it walks upright, and I'm sure that most people can't either. I do know what large fish look like when they skim the surface of the water, but get three or four together and it starts to look a lot like a sea monster. Put these people into an environment they're not intimately familiar with (even people who spent a lot of time in the woods get surprised on a very regular basis) and the odds of them misinterpreting a perfectly normal bit of ecology skyrockets. Third, most people don't know how to look. A friend of my sister's once posted a photo on Facebook saying it was some sort of mythical monster (the goat-eating one with the name that's impossible to spell, I think). At first glance, yeah, it's a bit freaky. Night-vision, grainy, etc. My brother-in-law and I spent some time carefully analyzing the photo, though, and even a brief analysis showed it to be flawed. The limbs were all kinds of messed up, the thing had the weirdest head shape I've ever seen--and you could faintly see the number on the football uniform he was wearing. Because my brother-in-law and I have some training in anatomy (paleontology requiers at least a little) we were able to see specific flaws in the photo. People who's knowledge of anatomy is limited to Scrubs episodes can't, and don't know what to look for. The 1982 inaugural issue of CRYPTOZOOLOGY, the journal of the now defunct International Society of Cryptozoology, ran an article titled "The Ri --Unidentified Aquatic Animals of New Ireland, Papua New Guinea." This article alone almost sank the Society's reputation. An aquatic creature roughly resembling the traditional "mermaid," and sometimes identified with it, is reportedly known through a variety of encounters with natives of Central New Ireland. The ri, as they are called, are frequently sighted by fishermen, occasionally netted or found dead on beaches, and sometimes eaten. Males, females, and juveniles are reported, subsisting on fish in the shallow seas around the Bismarck and Solomon archipelagos. It is unlikely that the animals are dugongs or porpoises, both of which are known to, and readily identified, by the natives. Wagner, doing anthropological fieldwork in New Ireland, heard reports of an aquatic animal "described as an air-breathing mammal, with the trunk, genitalia, arms, and head of a human being, and legless lower trunk terminating in a pair of lateral fins, or flippers." The article's evidence for the existence of the ri is exclusively made up of eyewitness accounts of the living and dead cryptid. Wagner stated that his eyewitnesses were credible and "whatever the ri may be, they are certainly not dugongs. While the dugong is comparatively rare on the coasts of Central New Ireland, the Barok [native peoples] know it as bo narasi ('pig of the ocean"), and perfectly capable of identifying it." Like many popular cryptozoologists, Wagner plays down the implausibility of the thing he wishes to consider or believe in. He admits: "From an anatomical and evolutionary perspective, the physical descriptions of the ri also pose problems, but a discussion of these is beyond the scope of this article." The "scope" of the article, then, is to create a cryptid based on eyewitness accounts and ignore the hard issues that might mitigate and compromise the sighting stories. Mainstream science has long maintained that mermaid sightings of centuries past, while part of various cultures, probably originated in dugong sightings. I always wondered how this idea arose. Certainly the dugong doesn't look human. Wagner and the Society went back to New Ireland to find conclusive evidence of the ri. Funny. They found that the ri were indeed dugongs. This embarrassment was unfortunate publicity for the Society. Where did the locals get the idea of dugongs as half-human and half-fish? Perhaps cultural contamination or mimicry: Wagner uncomprehensibly notes: "There is a tendency for natives to identify ri with the depiction of mermaids they have seen on matchbox covers or fish cans...."
Last edited by jerrywayne; 5th November 2012 at 07:01 PM. Reason: grammar. Hello, I'm a new member and this is my first post. Ever notice how cyptozoologists don't discover new species? They claim to want to discover new species but focus on celebrity monsters. yep, the new species are found by those crazy science adhering biologists! You're right, and they all seem pretty weak on their zoology too. Its publishing a paper about a new species of bug after years of hard work in the field, in the lab and in the library Vs. claiming there's a huge monster at your backyard while doing some "research" and posting through the internet. man I wish there was a huge monster in my backyard! That would be pretty cool! I could be on the picture box and meet Oprah! You know the drill. Just claim there is one. Sound sincere (whatever that means) and follow the sighting script/pattern trend of the season. Footprints, shaky blurry pictures of blobs and promisses about DNA assays are optional. Fame among cryptozoology circles is at your hands! lol, I already have fame among many of them (or from their perspective Infamy) I was called the most hated skeptic in footery on the Bigfoot Evidence Blog!!! My post had a point though (aside from picking fun at footers) most of us skeptics LOVE the idea of all this neat monster stuff. Many of us fell into it when we were kids by reading books written by many of the "golden age of footery" people. But we got older, learned about stuff like the scientific method, burden of proof and evidence and we started to see that none of these cryptids passed muster. But, If proven wrong tomorrow, I bet nobody would be happier than us to eat the crow! The PGF is a really cool hoax IMHO. If you've ever read my blog then you'd know I enjoyed the film and think it was pulled off in a huge way. I'm not endorsing their actions (hoax for profit) but if it had to happen for someone, a dude that was dying from a disease (that did succumb to it a few years later) at least got to have a blast in some ways before he went you know? I see it all in that light, and his friends and family (many of whom were used in some fashion as well) helped him achieve that. Someone needs to pull off a better bigfoot one soon. Maybe the people who are looking for bigfoot should learn from the people who discovered the saola. I bet nobody would be happier than us to eat the crow! Monstrous, mutated crypto-crow, no less! No, to them there's nothing to learn. With saola, okapi, gorillas, etc., people went to the places where those creatures live and easily obtained specimens of those creatures. With bigfoot, we've ALL been living where they live for, presumably, thousands of years, but they're just too smart and ninja-y to let us find any of their remains or take a decent photo. This is why bigfootery has changed so much since the PGF. It used to be that only those brave and adventurous enough to travel to the most remote places on the planet had any chance of encountering bigfoot. Now it's all about your attitude as a "researcher." If you approach the bigfoots with humility, good intentions, nary a hint of skepticism, and most important - with no camera - then the bigfoots will choose to reveal themselves to you. You betcha. How I would love to see a real picture of Champ. It's been a while since I could sail on Lake Champlain, but you can bet that when I did I made sure I had a really good camera with a telephoto lens, and that I knew how to use the thing. One even half-good shot of Champ would make my day and my fortune. Alas, all I ever got was nice snapshots of the lovely scenery and the lovely wife and the like. It sure is a pity (irony likely here) that all those professional and amateur photographers, bird watchers and the like, who spend hours aiming good equipment at the lake and taking tack-sharp pictures, never see the same critters that bozos who forget how to hold a point and shoot or a phone seem to see all the time. The Ogopogo example above pretty much shows how people may mistake the mundane. Also, had the family not filmed the creature and just reported it, then their "encounter" would probably have made it into a Jerome Clark or Loren Coleman book on the mysterious as a well documented lake monster sighting. The Ri article gave a hint as to the reliability of indigenous accounts relating to alleged unknown animals. Most cryptozoologists give much credence to local population reports, when in fact different cultures do not necessarily adhere to pure objectivity. The Ri story also gives an inkling that cryptozoology is less zoological than it is a modern re-imagining of the bestiary of folklore. Some sighting reports claim incredible cryptid attributes that ought to rule out mundane explanations. For instance, the recent Bigfoot sighting by the TBRC in Oklahoma, in which Wood Apes moved up hill at incredible speeds. The following is a Bigfoot hoax uncovered by John Green and reported in an old Bigfoot Bulletin. (August 31, 1970.) It shows how perception can get it seriously wrong when dealing with maybe monsters. I thought I remember reading about a Champ story where a woman actually opened fire on what she thought was the monster... And somehow a huge sturgeon turned up dead in the lake a while later from either A. Gun shots or B. Lake Monster bites and lake monster have bullets for teeth wow cool. I have no problem believing that certain eyewitnesses are completely honest that they believe they saw a monster. But as other have pointed out, human memory is not a perfect record of events and in any case it's carcass or STFU. Even the photos and videos are subject to human interpretation. Bobo sees some reflections in the woods and of all the things it may be the first thing that comes to his mind is Bigfoot. I shared the YouTube video above with my teenage daughter last night. As soon as Robert Stack said "the creature was seen moving back and forth between log piles" (paraphrased) she did a facepalm and figured out it was a beaver they had filmed. Note how Stack's script tried to help out the lake monster interpretation by reinforcing the erroneous idea that the monster was identical to a beaver except it held its head a little higher in the water when it performed the beaver tail slap, so it must be a giant snake/lizard, i.e., Ogopogo! Shows how programs are often driven only by ratings and not so much by edification. The Fouke Monster and the question of vetting. In October I went to Fouke, Arkansas to join a tour of "monster" related locations guided by Lyle Blackburn. Blackburn is the author of a well written and entertaining book favoring the existence of the local alleged Bigfoot: The Beast of Boggy Creek - The True Story of the Fouke Monster. Here is a picture of the group, with Blackburn in the middle, and Loren Coleman, Craig Woolheater, Jerry Halstead (of TBRC), among others. I'm in the picture too. While we were waiting for the tour to begin and as we meandered around the Monster Mart, Blackburn was informed by a local that there had been a sighting just a week before on a stretch of road that had had previous sightings. During the tour, Blackburn mentioned the new sighting. He even took us to the location. At some point in the tour, he mentioned that he would not be interviewing or questioning the person who had told other locals about the sighting. The person wanted privacy. Imagine my surprise when I later found this sighting listed by Blackburn on his website. Here is a brief recounting of the famous escaped Red Panda case. Also, its relevance to seeing cryptids --- brain functions seeking patterns. CHAMP: Super Otter or Dog? In May, 2009, Eric Olsen posted on YouTube what appears to be an animal swimming on the surface of Lake Champlain (New York, Vermont, Quebec). The lake is one of many that has a "lake monster" tradition; in this case, the monster is called Champ. While Olsen made no claim as to what he captured on his cell phone camera, others have jumped to the conclusion that he videoed the legendary Champ. My first impression, like those of others, was that the camera picked up a deer swimming on the lake. Others thought young moose. I changed my mind later when I realised that the object in the video does not have the tell-tale large ears that would be obvious with deer. At Cryptomundo, Coleman seemed to be flirting with the idea the image represented a "super otter." As far as I know, the super otter exists nowhere other than on the written page of Bernard Heuvelmans, one of the early leading lights of cryptozoology. The super otter was an attempt by Heuvelmans to explain certain sea serpent sightings, a maybe creature made to order. Coleman does nothing more than compare some stills from the cell phone video that compares well in the imagination with a hypothetical drawing of a super otter. He ignores the fact that the animal on the video certainly doesn't move like an otter, graceful and confident. In fact, the animal looks like a terrestrial animal temporarily finding itself in water. The Mad Skeptic, like Coleman, made some on site observations. Unlike Coleman, he came up with a more mundane explanation, and one that takes into account the apparent terrestrial origin of the animal in question. Sorry, you will have to search MS website for the article. He doesn't have exportable single pages (unfortunately). INteresting bit of de-champing there. Even if one clings to the hope that there's a monster out in the lake, I doubt you'll find it in a two foot deep swimming beach. I've been not very diligently following Champ sightings for years, living as I do near the lake, and secretly, idly hoping that a) there really is one, and b) I'll be the first to get a good picture. Most Champ champions like to think that wave sizes will tell you something, but this is a crazy lake, where you can go in a few minutes from a dead calm to three foot breakers, back to dead calm, then get knocked down as you wonder where those one inch whitecaps are coming from. Champlain doesn't need a monster, it is one. Otters do have a serpent like swim... That is if you have no idea how a reptile is physiologically supposed to swim. Otters swim in an up and down motion. It looks like the traditional western water monster. Reptiles move from side to side. I don't think any marine mammal swims from side to side and I don't think any reptile swims up and down. Maybe the extinct massive fish-like nightmare marine reptiles swam side to side? One of my earliest memories is my dad taking me to the Ohio river for the white bass run. The river was full of boats for the bass, there were tons. Not just people showed up to take advantage of the numbers but otters did too. I was scared to death of them thinking they were dragons or something. 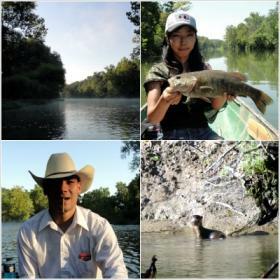 A few years ago the wife and I went floating on a beautiful Missouri Ozark river to catch some smallmouth. As we came around a corner we saw a whole group of otters, maybe about 5-6. They were the cutest little guys and they seemed pretty curious. They were on the bank and sliding down the cut and watching us approach over a log. Then, as a group and in a line they went into the river. The way they swam in an up and down fashion in a single file line and equally distant from each other made them appear to be a single animal about 12-15 feet long. The adult led the group which could lead someone to assume there was a distinctive 'head'. Combine that with an area with a reported monster and someone unfamiliar with the fauna of an area and you got yourself a monster sighting. In the lower right is the last otter we saw. Unfortunately we didn't get a picture of them swimming in a line, we were too occupied with how gosh derned cute they were and were a little late getting the camera out of the bag. They were also a fair distance from us. As a bowhunter I know it is tough to eyeball distance with any accuracy. Especially over water and especially if the object is at an angle or moving. What if you see something that there is absolutely no frame of reference for? Did they truly see something unique or misidentify something? Otters no doubt play a part in "Lake Monster" sightings. Here is a photo related to relating otters and Lake Monsters. 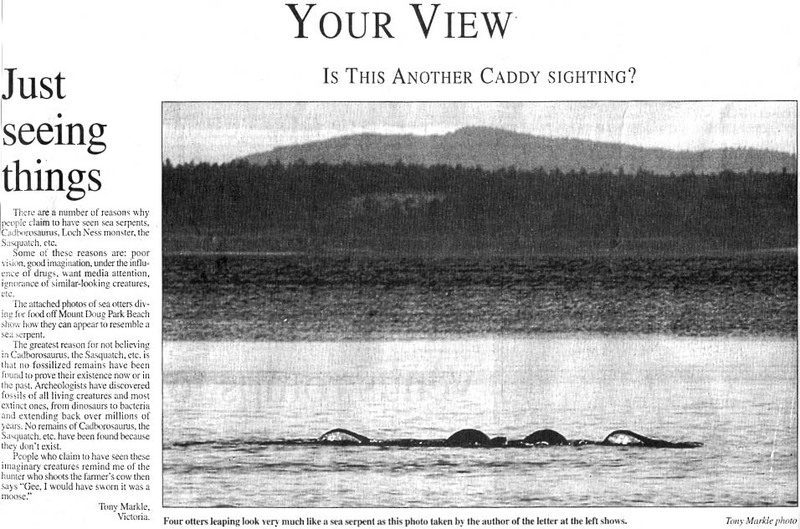 However, I think most "multiple humps" sightings on lakes are probably wave effects. Do you have an example of "absolutely no frame of reference for?" I would suggest that if there is no frame of reference, the sighting is inherently unreliable and inherently unusable. It hardly matters what you've seen. It's an anecdote. I do, and after a year of digging and researching, I figured out what it was but I had absolutely no idea of what I was looking at when I was actually under it. I saw something air born, a little higher than the roof tops, slowly moving toward my direction and when it was over my parked car I stepped off the porch to have a look. It was a grayish color with salt and pepper speckles and reddish phosphorescent balls connected with lines of the the same color. It had a soft glow and was transluscent. It had an edge that was fringed? or looked the way the edge of a quarter looks, serrated. It was square with rounded corners. When it moved, at a distance it appeared to flip end over end, up close it undulated and looked like it folded in on itself like a snail or jellyfish moves. I have taken a lot of crap for telling this and I figure I 'll get a lot more for telling it now but what would you have thought it was?